The Fed's mandates used to be to balance unemployment and inflation, but some economists say the central bank now takes into account keeping financial markets calm. With economic growth slowing, Wall Street gyrated Wednesday on the expectation that the Federal Reserve will not increase interest rates at its meeting, which concludes Wednesday afternoon. As recently as December, the Fed was expected to raise rates twice this year; now, economists say it might raise rates only once — or not at all, as the central bank seeks to avoid roiling the markets. “It’s very clear that there will be no hike on Wednesday, no question about that. The question, of course, is what expectations will be presented for the rest of the year,” said Dan North, chief economist at Euler Hermes North America. 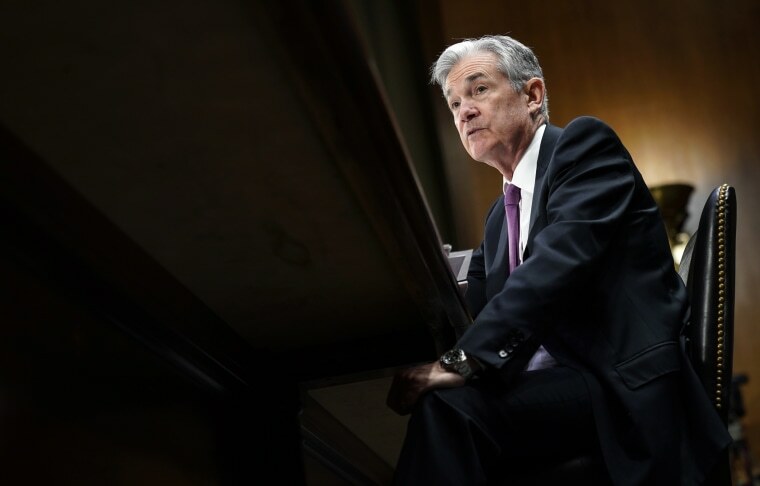 “The Fed is likely to try and convey or better quantify this ‘patient’ stance,” said Lindsey Piegza, chief economist for Stifel Fixed Income, referring to Fed Chairman Jerome Powell’s remarks in January. The CNBC Fed Survey for March predicted that GDP growth will fall below 2 percent in 2020, and the number of respondents predicting any rate hikes this year fell by 18 percentage points to 60 percent. Some economists suggested that the Fed today views avoiding or quelling market volatility as one of its main jobs — one that is related to but distinct from its long-term dual mandate of managing employment and inflation levels. To that end, economists predict that the Fed remarks will downplay the importance of the so-called “dot plot,” a probability graph created by combining Fed officials’ projections. The dot plot, which most recently suggested two interest rate increases for 2019, has a been a source of anxiety for Wall Street. “I think that there’s a chance that the Fed is going to abandon the dot plot,” North said. “The financial markets have been much better predicting what the Fed’s going to do than what the dot plot says,” he said, pointing to Powell’s reassurance of a “patient” Fed after a tumultuous December. “They pretty much came out and said, ‘We’re watching the financial markets,’” North said. The Fed’s desire to be more accommodative of market movement could be put to the test by an economic outlook that worsens faster than expected, though. “Depending on the pace of deterioration, I think the Fed is going to move pretty clearly to a more defensive stance,“ Piegza said, with a rate cut as soon as the end of this year. Some economists also worry that a more passive Fed could mean a less nimble one. Being able to lower interest rates to stimulate spending is one of the key weapons central banks can use to combat an economic downturn. “The issue we face longer-term is whether the Fed has accumulated enough dry powder to deploy in the next recession,” Thrasher said. Even with the recent series of hikes, rates are still far below historical norms, leaving the Fed with fewer policy options, Thrasher said. “Have rates gone up enough to give the Fed adequate firepower?” he said. “Right now they could lower rates by 240 basis points and cross their fingers that it will be enough."